This is a sponsored post written by me on behalf of The Nature Conservancy. All opinions are 100% mine. The holidays can become times of excess - so many big meals, so many parties, so many presents to buy, and not enough time to put up decorations, hit the sales, or attend the plays and productions. While putting in all the effort to make the holidays fun for all, it's easy to overlook the long-term environmental damage we may do. As Scouts, we should take the time to look and try to minimize our impact. Last week, I helped our pastor pick out and set up six Christmas trees in our sanctuary. Those trees were harvested from a commercial forest where they had been absorbing carbon dioxide, storing carbon, and putting out oxygen for years, as well as providing cover for wildlife. In the empty spots where they stood, new trees are being planted. Many BSA troops sell trees as a fundraiser. We got the trees for church from a local BSA troop that uses the church as their tree lot. After Christmas, our city recycles trees left by the curb, but I do know scouts across the country pick them up and recycle them as a fundraising service. Other troops sell wreaths. We've bought a wreath every year and I dismantle them when they're no longer needed in January. I compost the greens, recycle the metal, and re-purpose the pair of pine cones that come on each one. 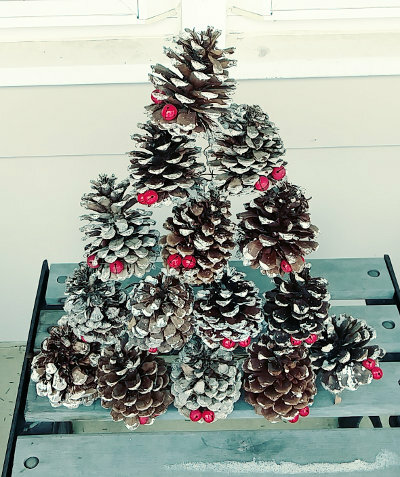 We've now got a couple of pine cone trees that help decorate outside our home, and another gradually being made. A big part of Scouting is getting out in nature, learning about it, enjoying it, and conserving it. My two Eagle Scout sons and I have enjoyed literally hundreds of days and nights in the great outdoors and we do try to ensure it will be available for future scouts. There are many other organizations besides the BSA that work to protect our world, sometimes doing a better job than us. The Nature Conservancy, for example, has priorities that align with Scouting. The Nature Conservancy has been helping keep spaces natural for over 65 years and has a mission to "conserve the lands and waters on which all life depends". They've protected well over 100,000,000 acres of land. Taking a bit from the Outdoor Code, they want to help us be more conservation-minded this year, and have created a useful Holiday Green Guide with good ideas to consider. Download the guide by entering your name and email to find out the best way to be a little greener this holiday season. By reading the guide and keeping the handful of easy tips in mind, you can have a happy holiday and help the earth. One of their tips is to use natural decorations when possible. Another is to help you with gift ideas. Buying presents just because it's time to buy presents can result in piles of "stuff" that doesn't get used and eventually gets donated or thrown away. Certainly give gifts, but be sure they are wanted. For those people like me that no longer have a Christmas list, giving a unique and interesting Symbolic Gift can be a good option. Symbolic gifts are typically monetary donations to an organization that the recipient supports, and the recipient receives some small item explaining what was given in their name. For example, through The Nature Conservancy, you can donate and have the recipient receive a certificate and bookmark about bison, orangutan, sea turtle, or other wildlife that the gift helps to protect. My wife and I have been giving symbolic gifts for years and this year we've asked our two sons to try it for gifts to us. Find out more about having a greener holiday by downloading the Holiday Green Guide - it will at least give you a few interesting topics to keep the conversations going at all those parties in the next few weeks.